LADIES ONLY! Bring your own firearm(s), ammunition and equipment once a month to meet, learn and shoot with other like minded women. 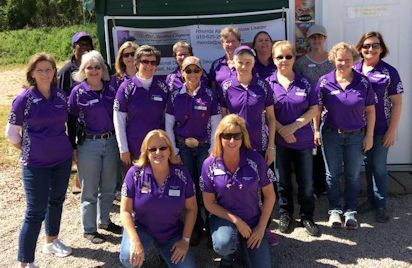 We host the NC Northeastern - Armed Angels chapter of The Well Armed Woman on the first Sunday of each month. Registration starts at 1:30 pm. A defensive concept will be taught in the classroom for one hour followed by one hour of coached range time practicing related shooting drills. The meeting will end at 4:00 pm. This national organization focuses on women teaching women firearms safety, marksmanship, and defensive shooting skills. Learn how to shoot and reload on the move, how to clean your firearm, how to prevent or quickly recover from stoppages and malfunctions, how to choose a firearm and holster, and much more! All experience levels are welcomed to join us. Visitors are welcome to attend one meeting in the classroom prior to joining. Only members can shoot with the group on the range due to national insurance rules. Visitors may choose to join the chapter during the meeting by completing a manual membership form and attaching a $50.00 check made payable to TWAW Shooting Chapters or join online, which will qualify you to shoot with the group the same day! Note: To renew a membership, wait until you receive a notification from the national office so you don't duplicate your membership. Regional Trainer and NC State Leader, Rhonda Allen, was recognized as the national 2017 Chapter Leader of the Year! Click here to join our local chapter! For more information, contact Rhonda Allen at 919-625-2988 or rhonda@apdsnc.com.